A new push is being made by corporations and banks in Detroit to drive even more working class, poor and nationally oppressed people out of the city. This fact is being illustrated by recent developments in the downtown area and its environs where low-income people are being forced to move from several apartment buildings. In the Cass Corridor, a heavily depressed area that has been neglected by the City government and the business magnates for years is now the apparent focus for the construction of a new sports stadium. The owners of the Detroit Red Wings may be attempting to take control of sections of the Corridor in order to either gentrify the district or engage in “developments” that will not benefit the interests of the current residents. Residents in three apartment buildings on Henry Street between Cass and Second Avenues received a hand written notice on April 20 saying that they had to move out within thirty days. Another document which appeared to be a “Notice to Quit” was also handed over to the residents. However, neither of these documents appeared to be validated by 36th District Court where Landlord-Tenant matters are handled. Since the tenants are mostly senior citizens, single parents, people living with disabilities and marginalized workers, the supposedly new owners, who have not come forward to publically claim responsibility for the illegal attempts to evict, feel that they can get away with these blatant acts of disregard for hundreds of people. All together there are over 200 apartment units spread out between the three buildings. Some of the residents have lived in the buildings for over thirty years while others are newcomers. One resident told this writer that he had just moved in one month ago. He said that he paid the first month’s rent and a security deposit in addition to purchasing furniture for the apartment. This resident is now irate that he has been told to move by May 20. He wants to take some legal action to recover his money and obtain resources from the new owners to relocate. This is the sentiment among other residents as well. A meeting was held on Sunday afternoon April 28 in a vacant lot across the street from the apartments. The residents are angry and frustrated and are looking for assistance. Members from various organizations including the Moratorium NOW! Coalition to Stop Foreclosures, Evictions and Utility Shut-offs, attended the meeting. However, since it is not clear who really owns the building now it will take some serious inquiry and political action to uncover those that are responsible. Residents of the apartments have also been told that their electricity, gas and water will be shut-off after May 20 creating even more uncertainty. The situation in the Cass Corridor is being replicated throughout the central city area. Two other large apartments downtown are also being taken over by new ownership where the residents, who are Section 8 renters, are being ordered to move. These developments are taking place at a time when the federal government and private industry are not building low-income housing. Detroit, which is now under emergency management at the aegis of the banks, is being exploited at an even deeper level than what has prevailed over the last decade. 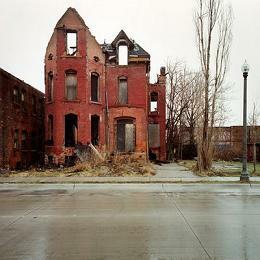 The foreclosure and eviction crisis hit the city of Detroit with vengeance beginning in the mid-2000s. The U.S. Census report indicated that approximately 237,000 people left the city during 2000-2010, which is 25 percent of the population. Members of the Moratorium NOW! Coalition traveled to Coldwater, Michigan in the southwest region of the state on April 24 to support the Murray family who are facing foreclosure. The Murrays have been fighting to maintain their home for the last four years and are represented by anti-foreclosure Atty. Vanessa Fluker of Detroit. The judge in the case ruled against them and ordered the family out of the home within ten days. The Murrays had placed over $40,000 in an escrow account while they exhausted all of their legal options in the case taking it all the way to the Michigan Supreme Court. In Portage, Michigan, also in the southwest region, the Benthin/Mac family was facing imminent eviction during the week of April 22. As a result of an e-mail and phone campaign, they were able to win a temporary stay of eviction. Noting the continued problems of home foreclosures, the Moratorium NOW! Coalition called for a demonstration outside the Detroit headquarters of Bank of America on Friday, April 26. Members of Detroit Eviction Defense, the UAW and other groups joined in the protest as well. On May 20, UAW Local 600, the largest of its kind in the country, will be hosting a public hearing with officials of the banking arm of Fannie Mae and Freddie Mac, the Federal Finance Housing Administration. Homeowners are being encouraged to participate to expose the damage being done by the federal government which is the major player in the foreclosure process at present. Although hundreds of billions of dollars have been allocated for federal housing programs through TARP and HAMP, most of the funds have not been spent because the banks are refusing to participate in efforts to keep people in their homes. Several agreements between the banks and the Justice Department related to fraud and discrimination have not resulted in a shift in federal housing policy. Only a mass movement led by working class and nationally oppressed people can lead to the adoption of policies that recognize housing as a fundamental human right. The current phase of capitalist development is resulting in the further impoverishment and marginalization of tens of millions of people throughout the U.S.
Are Detroiters being evicted to make room for a new Red Wings arena?